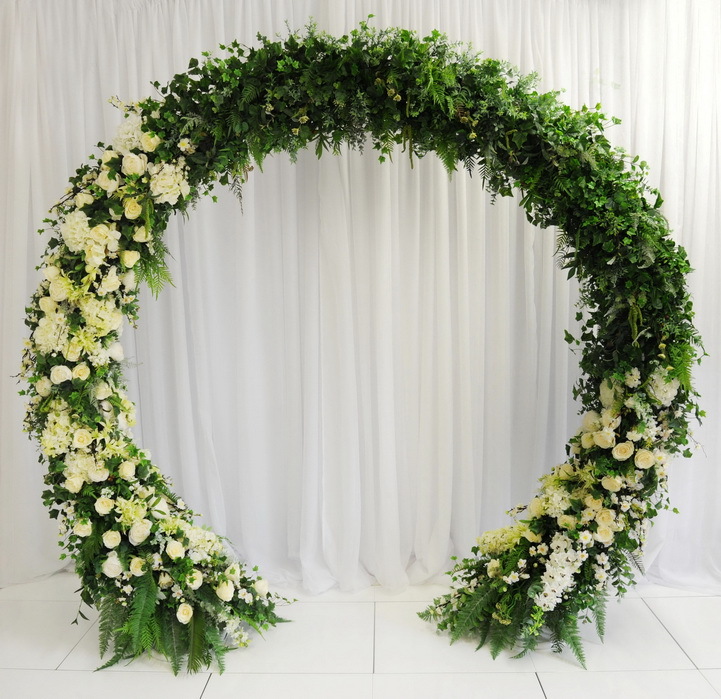 Transform your wedding ceremony with a beautiful floral archway! Not only will a floral arch wow your guests but it also creates the perfect photo opportunity for your photographer. Here are 4 reasons we think you should choose silk over fresh! 1). Your guests will never know! If only the best silk flowers are used to design the floral arch it will create the illusion of beautiful fresh flowers, but of course only you will know that. Often refered to as floral moongate , round floral arches or infinity archways, are one of the hottest wedding trends of 2019! There are no arguments that this would be an amazing backdrop to whilst making your vows! 2). You can have out of season flowers in your wedding! With silk floral arches you can incorporate some of your favourite flowers without having to worry about whether they are available and in season. 3). Matching Decor! Another huge bonus to choosing a silk floral arch is that you can always add to your wedding with matching items! You can team your arch with matching aisle decor such as a floral pedestal, perfect for adding wedding flowers towards the top of the aisle or along the seat ends. Or you could tie in your ceremony flowers with your venue styling and go with a matching personalised table plan or welcome sign! 5). Last but certainly not least, the cost! As im sure you know by now, weddings can end up being a little more costly than first expected. So finding out the price of your dream arch may come as a shock. Then you find out hired floral arches are a thing and voila, panic over! There’s no reason why you can’t have the wedding you’ve always dreamed of, sometimes you simply have to look for alternatives! Silk wedding decor now means that almost anything is possible at whatever time of the year, whether you require ceremony decor, venue decor or bridal flowers, it is possible. Thanks for reading our blog! Keep an eye out for more tips on how to achieve your dream wedding with a budget.